All classes are indoors in a climate-controlled environment! if you are experiencing advanced behavioural issues with your dog such as aggression, profound fear, or reactivity towards other dogs. 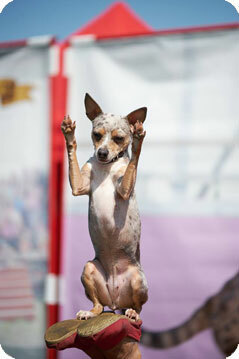 Train your dog to provide therapeutic visits through trick shows! We only offer a certain number of classes per month so be sure to register in advance to receive a space in our highly popular program! We pride ourselves in offering quality instead of quantity. Please email to confirm your registration! Both the group and private dog training lessons are conducted by an instructor with extensive dog training and behaviour experience and come with written handouts. All Puppy, Basic, Intermediate and Advanced Class start dates listed on the calendars run consecutively for 6 or 7 weeks with the exception of major holidays. Schedules are subject to change. Please notethat for the safety and peace of mind of all of our clients, all dogs that are in training must provide us with proof of immunization. Due to our restricted class size there will be no refunds once the course has started, however we do offer one make up body language if you are unable to make a class. 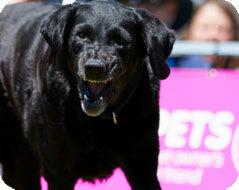 FEARFUL/REACTIVE DOG PROGRAM: We are specialists in working with fearful or reactive dogs. Let our 20 years of experience aid in easing your dog's fear and anxiety to live a better life. The first session is always 1 hour, follow up lessons are 30 minutes. Reactive dogs will be exposed only to professionally trained calm decoy dogs in a controlled environment to start, then the family is given direction on how to integrate the training to the 'real world' on the walk.­ Follow up growly dog tricks classes are offered to graduates of the program that could benefit from more controlled exposure in a new environment. 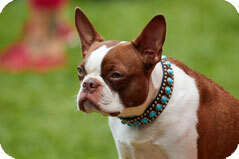 E-mail ustoday for our recommended protocol for your dog! Confidence: Courage is a muscle. 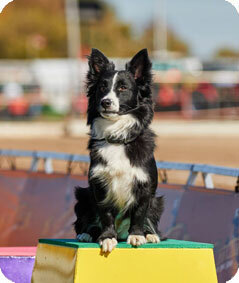 Learning to overcome obstacles builds trust with the handler and confidence in the dog. Great for shy dogs! Focus: Practicing a skill that is FUN for the dog teaches the dog to enjoy working with the handler and increases the bond and focus for every day obedience. Mental stimulation and exercise: Dogs need a job. 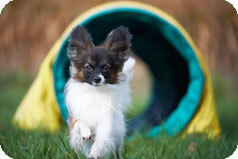 (Or a hobby) Agility can be like soccer or gymnastics for your dog. Having a "job" can decrease hyperactivity or issues that arise when your dog finds his own job. Positive experiences are critical for socializing a puppy to become a well adjusted adult free from fear or reactivity issues. In these dog training classes with other people, children and puppies, your pup will be socialized through supervised play sessions as a professional trainer shows you how to foster confidence and appropriate play. According to the American Veterinary Society of Animal Behaviour, the recommended time to start is as early as one vaccination. A well run and sanitized puppy class is not the same as an off leash park. Preventing behavioural issues and starting your puppy off on the right paw will make a huge difference in having a well behaved adult! 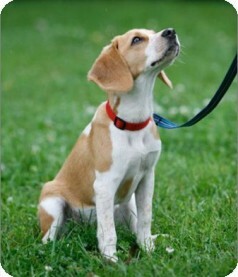 Training in a group environment is fun for both the dog and handler and teaches your puppy to listen under distraction. Through our positive motivational methods, let us teach you how to motivate your dog so that he wants to learn and enjoys training. While we offer high levels of obedience training, our puppy program is geared towards having a wonderful and calm family pet, not an obedience competitor. Our exercises are based on calm, impulse control, greeting others with manners, teaching focus, walking well on leash, and relaxing on a mat. Located right inside the city of London Ontario, our group and private dog training classes are all taught by an instructor with extensive dog training experience and you’ll receive written handouts with each class. In this class we teach everything you ever thought that you wanted your puppy to know including; crate training, house training, puppy mouthing, self control, fading the treat lure and using environmental rewards, appropriate play in dogs and more! Obedience exercises include teaching your dogs to focus on you, sit/down/stand on verbal cue or hand signals, leave it, walking on a loose leash, drop it, coming when called and stay. $185+HST, 6 week program; Email today to register! Do you have a rambunctious older puppy that gets over excited in public? Perhaps you have acquired a rescue dog that has not had much socialization or training, we can help! Group training will not only help teach you how to properly handle your dog, but also help your dog learn to listen under distractions. Through our positive motivational methods, let us teach you how to train your dog so that you can enjoy him when you are out in public or have visitors come over. All group obedience classes are located right inside the city of London Ontario in the beautiful Southside Animal Clinic. Our dog training instructors have extensive experience in dog training, dog behaviour and all lessons come with written handouts. This class is for both older puppies and friendly adult dogs, because it is never too late to teach an old dog new tricks! We agree that dogs are highly social animals that need leadership but it is clear that we can provide this using a positive approach. Training in a group environment is fun for both the dog and handler and teaches your dog to listen under distraction. Through our positive motivational methods, let us teach you how to motivate your dog so that he wants to learn and enjoys training. While we offer high levels of obedience training, our basic training program is geared towards having a wonderful and calm family pet, not an obedience competitor. Our exercises are based on calm, impulse control, greeting others with manners, teaching focus, walking well on leash, and relaxing on a mat. This is when training starts getting really fun! How would you like to impress your neighbours with a really well trained dog? We can show you how to take training to the next level and have a dog that can hold a stay on a mat while guests come through your door, heel nicely beside you, respond to your cues at a distance and hold a stand stay for examination. With focus on both obedience and exercises to continue working on self control and manners-this class has it all! Whether you want a better behaved pet, get involved in dog sports, continue obedience for fun or mental stimulation-we are experts in training dogs! 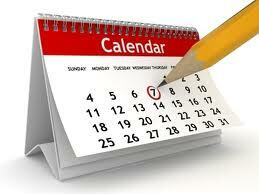 $185+HST 6 week program; Email today to register! This class is geared towards high levels of Obedience, but would also be good for obedience in preparation for Agility training, Rally-0, The Canine Good Neighbor test or just a fun past time to enjoy with your best friend! Focusing on incredible obedience exercises including; heeling exercises, sit/down in motion, drop on a recall, group sit/down stay, out of sight stay, retrieve, recall with finish~and more! Some of the clients out of the advanced training have joined the Ultimutts, TV appearances for CBC, Rick Mercer, and Pet Network. If you can think of it, we can teach it to your dog! If you would really like to impress your friends, have an incredibly well trained dog or have a good time training with your best friend-this class is for you!! Our specialty is trick training! Trick training is fun for many reasons; Mental stimulation during the winter months when your dog is unable to get out, tricks require minimal space and they can be catered to your dogs specific skills or personality, increasing success and fun. Mental stimulation decreases behavioural issues like hyperactivity as well as increases the bond between owner and dog. Taught by Melissa Millett of the Ultimutts, Melissa’s dogs have travelled the country with Ripley's Believe It or Not, winner of the 2013 Talent Search for the Pet Network, Winner of the 2015 GMA 'Pawlympics' on Good Morning America, and more. Your dog will learn to jump through your arms, say prayers, play dead, spin, weave and more. Come to this incredibly fun course and we will show you how to teach your dog some incredible tricks! Canine Body Language Seminar • 1 hour, humans only please! Learning how to understand your dog's body language will decrease stress and prevent behavioural issues later in life. $25.00/ per person - 2 people/$40.00; Email today to register! 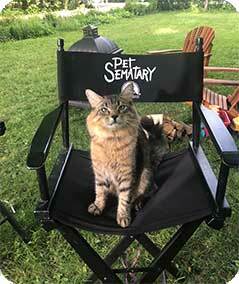 Top dog and owner Melissa Millett has paired with Kirk Jarrett Productions to offer animals for film and TV. Since teaming up with Kirk, Melissa has worked on major productions for Paramount, Warner Brothers, Netflix, and multiple fortune 500 commercials. In order to develop a variety of breeds to offer for productions, In Dogs We Trust will be offering Hollywoof classes to train the dogs for the specific behaviours needed to be on camera!